He’s not a cyclist. He’s neither an engineer nor a metallurgist. Like many other successful Italian businessmen, he’s conservative in appearance and in character. Still, this is Valentino Campagnolo, and unlike any other successful Italian businessman, he is the keeper of a flame. A keeper of an empire. Son of Gentulio Campagnolo, Valentino is an example of the burdens that a famous name and legacy can bring. Not unlike his Japanese counterparts who carry the Shimano name, Valentino Campagnolo has a lot on his shoulders when he awakes each day. Just as it is with the Shimano brood, the burden has as much to do with the daily business of running a bicycle component company as it does bearing the family name itself. For Valentino, ‘Campagnolo‘ is a name that’s as entwined in the history of cycling as it is Italy itself. In the annals of European bike racing, ‘Tullio’ Campagnolo was a bike racer of little note. But when his freezing hands were unable to remove a wheel during a cold weather stage in 1930, he visualized a quick release mechanism that would eventually lead to the empire known as Campagnolo SRL. Beyond the quick release, there was also the little gizmo known as the rear derailleur that he introduced in 1949 that would have a fairly large impact on the sport. Perhaps the one invention of his that would have ramifications well beyond the cycling tifosi and prove the ultimate Italianess of the Campagnolo name was the self-centering wine bottle opener that he received a patent for in 1966. A glass of Chianti, anyone? Until you spend some time with Valentino, it’s not ever clear just how profound an impact his father’s legacy plays in his life. But ‘Tullio’ is a theme that he consistently returns to as he describes one vestige of the business after another. It is his father’s legacy, after all, that has spawned everything from countless Tour de France victories to the many bike geeks who ride across the globe living and breathing all things Campy. You know the type. Partisan zealots who fiercely defend the iconic brand by heralding every new product as innovation, who dismiss their less successful designs and proudly display the winged QR logo tattoo on their calf. It’s for all that that Valentino comes to work each day professing to always do better. The Campagnolo factory is located in Vicenza, Italy, just minutes off the A4 highway that acts as the vital link of commerce for the industrial zone that is northern Italy. Including their subsidiary operations, the Campagnolo workforce totals around 700 people. Valentino is both the namesake and CEO, and the privately held company has an annual income of nearly $175 million. Despite the romantic notions that some Campagnolo fans might imagine, the headquarters of the fabled Italian component maker are rather drab. As much as Campagnolo’s continued success relies on its vaunted heritage to engage contemporary consumers, it is obviously a company not prone to sentimentality. Besides the occasional race win poster and an etched piece of glass with a visage of Tullio in the main foyer, there is not much to indicate that this is the origin of so much celebrated passion and history. Strangely, despite the company’s road heritage, it was at the Fat Tire Festival in Moab, Utah, where I first met Valentino back in 1990. Campy was just starting to make inroads into their ill-fated mountain bike effort, so Valentino flew out to the celebrated event to get a firsthand look at the crazy sport that was just beginning to be aware of its meteoric rise. Stranger still was when later in the week I found myself standing outside the costume party watching Valentino (with all his traditional Italian sensibilities) size up a ribald, seven foot tall incarnation of Frankenstein who was equally awestruck at meeting the son of Tullio Campagnolo. One year later Valentino was on more common ground as we whisked our way towards Campagnolo’s hometown in Vincenza from the Milan bicycle show. Valentino had booked us dinner at one of his favorite local dives, ‘Il Leonconi,’ and it was there that I was introduced to the Italian delicacy of boiled meats! Valentino is an impeccable host and I felt guilty for causing him a moment of distress by feigning instant and strict vegetarian requirements that not only had me passing on the grayish (and largely unidentifiable) body parts presented with some level of fanfare, but also in forcing the chef to scurry back to the kitchen to scrounge up a salad and plate of grilled vegetables! Almost two decades later I once again found myself visiting both the Milan show and the Campagnolo factory. Once again I was able to sit down with Valentino and talk about life, cycling and the wondrous mystique that is all things Campagnolo and Italy. RBA: Campagnolo is celebrating their 75th anniversary. What does that mean to you? Valentino: It is not just a celebration. To just celebrate is not what my father would’ve desired. We all deserve to dedicate greater effort to promote our activities. 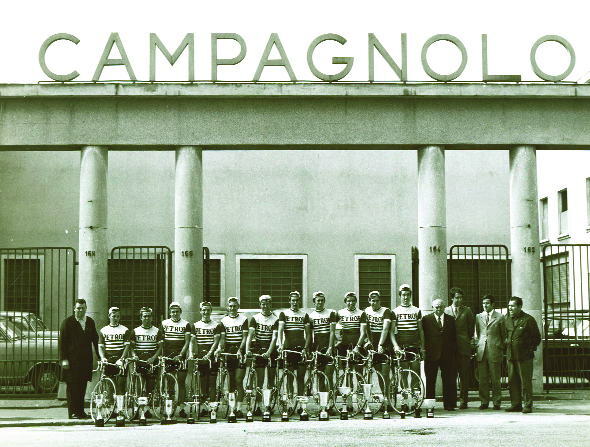 This time marks an important moment to think about Campagnolo’s status and accomplishments. We are ready and willing to demonstrate to the aficionados that we want to continue in the tradition that has taken us to where we are now-always respecting the fundamental ideas of quality, performance and the kind of service my father desired. RBA: Campagnolo’s history is so rich with racing success and product development, what would you characterize as your proudest achievement? Valentino: I would say that I’ve kept strongly the key point of reference that guided my father; dedicated to quality and to always stand behind the racers, to support them and listen to them. RBA: Was it your father’s own history as a racer that keeps the competitor’s integration into the company so important? Valentino: Probably, yes, but it’s also because the racers will always provide the fundamental momentum for product testing. There are many test facilities we use indoors, but the real test is on the road. The road remains the true judgment. Racers are a special breed of people-each different, but with a capacity to get others to be so enthusiastic about what they do. If we can translate their needs and opinions we can transfer to the market something unique. Something not just from the engineers, but a product that contains all the racer’s suffering on the bike. The racers want to win-what better for us to do than to support them? RBA: Of the many that you have produced, do you have a favorite Campagnolo product? Valentino: I would say the Ultra-Torque crankset. We were looking for a new concept there and we needed to develop something more rigid with better performance. There were plenty of other good products and solutions on the market and we asked ourselves, ‘What can we do differently?’ We started from scratch and pursued something that was not only stronger and stiffer, but important too, simpler to fix on the bike. We had some strange ideas, but I feel that if a product can contain a certain simplicity, then it is a winning product, no matter how complex it is to design and build. RBA: So much has happened in Campagnolo history with so many victories and acquaintances, I was wondering if it’s possible to develop a best memory from it all? Valentino: Yes, that is difficult to say. Each single day as been like climbing a steep mountain. On a long climb you wait for the switchback or flat section to pause before starting to climb again. My life has been a kind of race against everything with so many climbs and maybe without being so well trained! And, if you stop to rest, the others pass and go even further. The Tour de France has 22 days, but for us the finish line is never there. Yes, you can take a holiday, but the race is never finished. What I mean to say is that my father still has a big impact at Campagnolo and so for me, celebrating him with the 50th anniversary gruppo was very special. RBA: Does your name inspire you with a special motivation? Valentino: There is a big [Campagnolo] sign outside this building that reminds me of two things: 1. All the effort that my father made. 2. All the fatigue that he endured. He came from very poor conditions and worked very hard to build something. Also, the bicycle is a very beautiful thing. It has a great future because it makes us feel so much better and the Campagnolo name is part of that. And the racers, they are trusting their lives to your product so they must have total trust on what you have made. That they do gives me a very special feeling. You see the racers coming downhill at a very fast speed in the drops-totally committed, and so I ask, how can we not have that commitment as well? RBA: Valentino, since I first visited you in 1991 so much in the industry has changed. Undoubtedly, one of the biggest changes has been the move to Asia for some key Italian companies. Does Campagnolo have ambitions to move production there as well? Valentino: That is a good question, and I have immediately the answer which is not built for you but one we gave ourselves already. I am convinced that we need to keep our technology close to us. Everything is getting so sophisticated. The products are getting lighter and stronger-at the same time in opposing directions! The choice is to manage that or ask somebody else to. We will continue to make our products not just to say ‘we made it,’ but to continue learning. That learning enables us to go further tomorrow and to tell the market something else from what others can tell them. We have production facilities in Vincenza and Romania, and Record cranks are made in both places. So we are aware of the need to find ways to make our products less costly and we are opening a new facility also in Europe. It is important to keep the production close where we can manage it and make it compatible with our skills. We also know that this does not allow us to reach the optimum economic point, but that is not the key point. All I can say is it is a good way to handle the development of the company. RBA: You refer to the racers very often and I was wondering, of the many that you have come in contact with, do you have a favorite? Valentino: That question is not an easy one. I would say, not because he was the favorite of my father, but because I had the chance to see and know him, Merckx. He was the best example of a pure racer because he was never satisfied. He never played the game of picking and choosing which race to win. He engaged himself each and every day. He could’ve had an easier approach in his career, but he was a racer 100-percent, no matter if it was the Tour de France or a small, local race. Merckx is the best demonstration of how it is to be a racer-always aiming for more. A lot of times he won and a lot of time he lost, but he always exhibited a total willingness to fight. RBA: What about the doping? We have seen it affect many supporters of the sport; does it leave you discouraged? Valentino: I think of Miguel Indurain. He was like Merckx, always ready to fight and to win in a clean way. Nobody can say anything about Indurain. When it came to drugs he left. It wasn’t the end of his talent, but his unwillingness to engage something that wasn’t a part of his mentality. I ask myself why we can’t bring the world of pro racers to that point. We need a new way for people to compete against each other. Racing contains a huge amount of values. We need to deliver those values to the new generation-we cannot destroy them. RBA: In terms of new products, what direction do you see Campagnolo headed in? Valentino: That is very simple. The bike is a vehicle with the engine being the rider. The vehicle can be carbon, steel or titanium, but it is clear that it is possible to increase the performance of that vehicle. The new generation is born in electronics; it is an aspect of their daily lives. Obviously, if we plan to bring the new generation to the bike we need to develop new products with the type of technology that is in their blood. And so we are engaging in electronics. The important reminder is that if you need an engineering degree to work on it, we have made a huge mistake. With everything on the bike exposed like it is, the job of electronics is not easy, but it is a job that must be taken. RBA: This is either the most complicated or most simple question – what about Italy? Valentino: Here you can find a very emotional way in every aspect of our life starting with the basics; food and fashion. In Germany, like Japan, they have a very high-tech automobile industry, but in Italy we developed Ferrari and Lamborghini. In Japan they have Honda and Yamaha, while we have Ducati. I think also in Italy we have a special way to think about business which can also be applied to Campagnolo. Making money is a natural need and consequence, but it is not the target. Instead, I think, it is to satisfy an emotion. That is the common thread of Italian life. I think if you look at the Formula-One teams of Ferrari and Toyota you will find very few similarities. In America you have Starbucks. We have Illy. In America you have Pizza Hut. Here we have the local pizzeria with very beautiful pizza. The Italian way is how to see life. We have many brands in Italy with names that sound magic, but that might not be with huge profits on Wall Street. RBA: What role does that emotion play in your products? Valentino: The priority is to start with an emotion while searching for something special which, in the end, satisfies the people. When we start to develop a new product, the priority is not to make a huge profit. It’s to make something nicer with better performance. The ultimate satisfaction is knowing that we contributed to making a better product. I’m not saying there can’t be other approaches, even other winning approaches. This is just the Campagnolo approach. One of the interviews we had at the Campagnolo factory was with Giuseppe Dal Pra, the R&D Manager. We talked about many technical issues to try and get an idea of where the Italian parts maker is headed. Here’s some of what he had to say on the key topics of the day.